Four Philadelphia Phillies pitchers combined to hold the Atlanta Braves hitless in a Labor Day afternoon game. Cole Hamels hit a batter and walked five but allowed no hits in six innings of work. After throwing 108 pitches on a day that reached into the 90s, Hamels yielded to a trio of relievers after the sixth who stewarded his no-hitter to completion. Jake Diekman, Ken Giles, and Jonathan Papelbon actually improved upon Hamels’s impressive body of work by allowing not a single base runner in the last three innings of play. 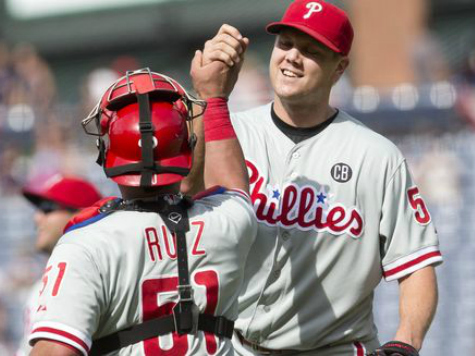 The combined effort gave the Phillies their first such collective no-hitter in team history and reason to cheer during an otherwise dreadful season. Centerfielder Ben Revere knocked in five of the seven Philadelphia runs on a sacrifice fly, triple, and single. The Philadelphia foursome joins Dodgers starters Josh Beckett and Clayton Kershaw, and Giants ace Tim Lincecum, as hurlers of no-hitters during the 2014 season. The gem stands as the team’s first no-hitter since Roy Halladay’s postseason no-no in 2010, which followed a regular season perfect game by the pitcher.